I’m A Winner Again! And So Are You! Good news, everyone! So I won the sweepstakes to preview Star Tours on Friday, except unfortunately I’m having surgery on Thursday which makes Friday a no-go for me. HOWEVER, I also entered the contest for Annual Passholders previews, and I won one of those! So I will be riding Star Tours on Wednesday the 25th from 9-1 or thereabouts. Hooray! I also selected a winner for our Wishing Well contest, and I’d keep you in suspense but I’m just gonna tell you right now that the winner got an email from me, so if you didn’t get an email it wasn’t you. 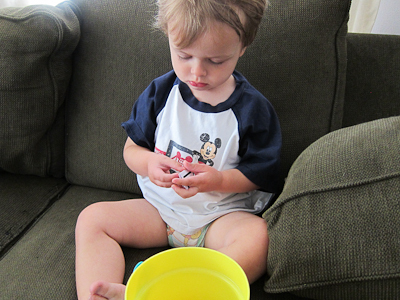 Rather than the boring old random.org approach, I went with the classic toddler selection approach. 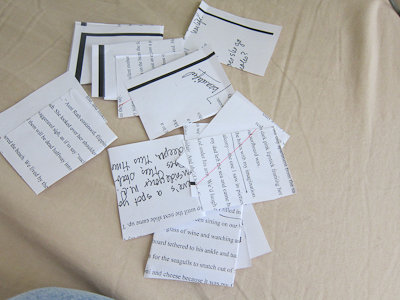 There weren’t a lot of entries so I just took a piece of scrap paper and cut it up into rectangular-ish pieces. I then wrote everyone’s names on a slip. A few notable exceptions–Carol guessed correctly but indicated that she didn’t need the ears, however on the last contest she said she would donate them to Audrey (Kristin’s daughter, whom Carol doesn’t know but she’s nice like that) so I entered her on behalf of Audrey. Also, Nancy did not guess correctly, but I appreciate the comment love anyway, so she went in too :). And Melinda (Bowmans in Bavaria) did not guess the answer but did give some fascinating information about Erika Fuchs, the translator who named Onkel Dagobert Duck, so I threw her in there as well. After all the railing against pink I just did, I used a pink pen. Oh, the irony! 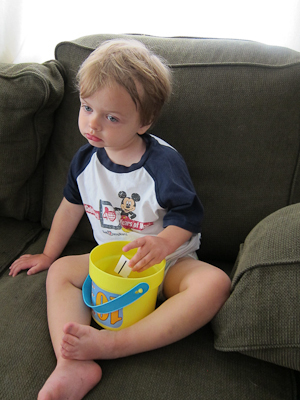 I placed the papers into a toy bucket and gave them to Theo to choose one. Theo is fighting an ear infection, so he was completely stoned out on the couch, which is VERY different from his usual affect so you know he’s sick. His primary concern was the fact that I was blocking the tv. Get out of the way, Mom! He’s wearing his Mouse-in-Law shirt, by the way. Anyway, after a long lecture on the importance of this job and how he held the fate of the world in his lap, I finally got him to pick a piece of paper. I should mention that he is channeling his inner Donald Duck by going pantsless. 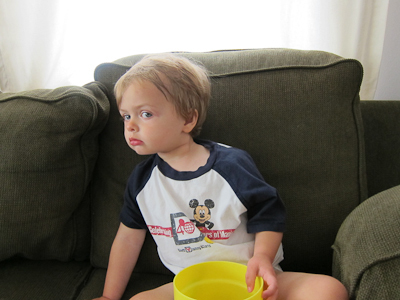 But he was sick and I wasn’t going to wrestle him into a pair of pants just so I could put a picture up on the internet. Where’s the fun in that, when it comes to be Prom time? Congrats Kaylyn. Check your email! And also, the official MYWTM Jedi Training Academy date has been set–Tuesday, June 7th at the 11:30 show (ideally meet around 10:30 and get set up). If any future Jedi are free that day and would like to join us, let me know! 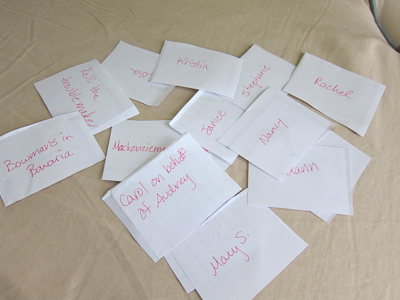 Thanks to everyone who participated in the wishing well contest! Last time I used random.org to select my winner but then my friends said they liked my original method better, which was putting everyone’s name on a piece of paper, folding them up, and having Theo draw one out of a hat. It’s not as scientifically fair as random.org, but it does make for a cuter picture, so you will have to wait on the winner until my name-drawer wakes up from his nap. Also, thanks for hanging in there with MWTM last week–big assignment due for school and the Vegas trip and all, but I’ll be able to devote more time in the coming weeks. As you may recall from my post about Mickey’s House, Toontown is a little area in the back of the park that houses, among other things, the classic Mickey and Friends characters and the lamest ride in the whole park (Car Toon Spin). 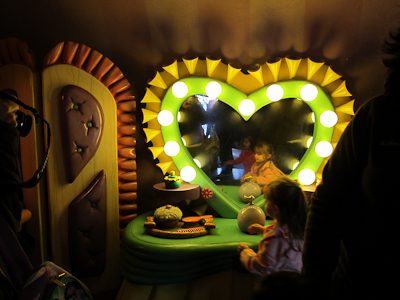 Mickey’s House is quite large and culminates in a meet and greet with Mickey. 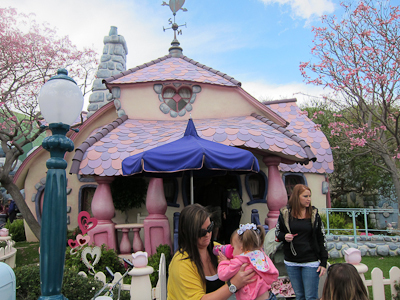 Minnie’s house, on the other hand, is smaller and there’s no meet and greet. The first thing you see at Minnie’s House, aside from Minnie’s House itself, is the rather terrifying mailbox. And here’s the house itself. It’s very…pink. Have you noticed that pink is not my thing? 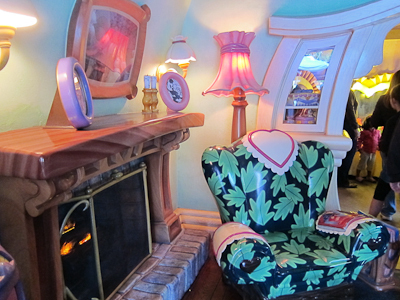 Anyway, like Mickey’s place, Minnie’s House has a lot of things to sit on. Minnie is very, very, very into hearts. 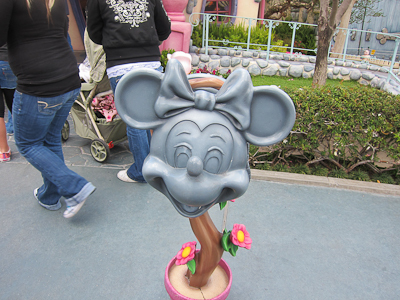 Minnie also has some sort of…I actually don’t even know what this thing is. It’s got, like, buttons and stuff, or something. Theo was equally confused. It's got, like, buttons or something? Minnie is also very, very, very into the domestic arts, particularly kitchen-related domestic arts. She’s got a plate of cookies for you, with a weird holographic set of chocolate chip cookies, which you can see at certain angles. Minnie also has a dishwasher and if you push a button somewhere, the light comes on and water swirls all around and stuff. For some reason, this is like visual crack to small kids and they all sit there glued to it until their parents drag them away. 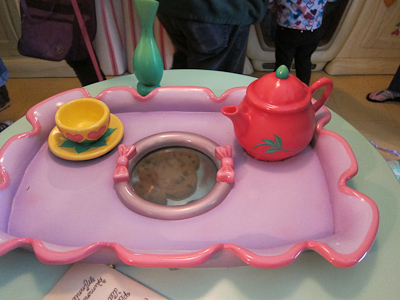 Minnie didn’t just stop with the cookies she was baking. Oh, no. She has a cake too. The cake is in the oven, and when you push a button on the oven, it lights up and the cake slowly inflates, like it’s supposed to be rising and all or something? 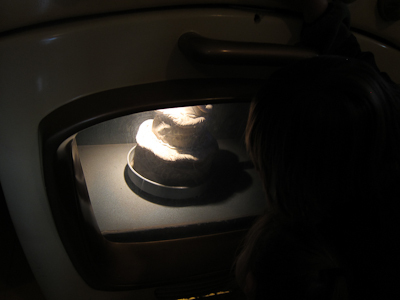 But then it deflates when its little cycle is over, like a bad souffle. I think it’s supposed to represent a cake rising and becoming a fully-frosted cake inside the oven but really it makes it look like cake is some sort of weird balloon you really wouldn’t want to eat. A fully-frosted cake with candles inside the over. Minnie has got some mad baking skillz, I tell you. 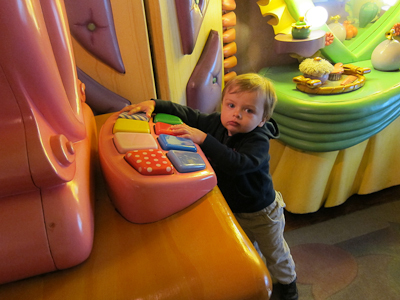 Minnie’s house also has lots of things to pull and push and play with. 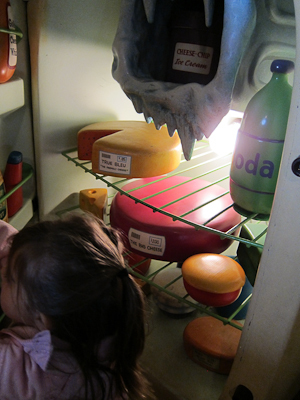 In her kitchen, she’s got a refrigerator that opens, and then small children like to climb inside. No, not my small child. He was still mesmerized by the dishwasher. 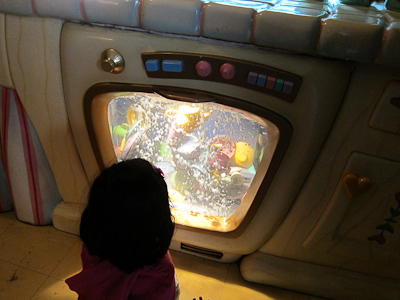 It's time to defrost the freezer, Minnie. You'd think Disneyland could have sprung for a frost-free one. 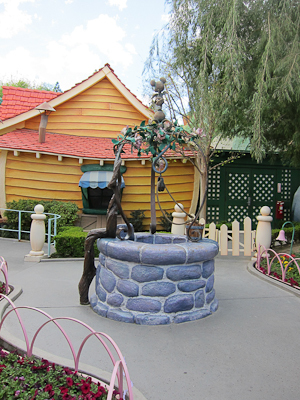 And of course, outside, there’s the now-famous wishing well, where Minnie talks to you like she’s inside there or something. Lassie, get help! Minnie's in the well! Minnie’s House was cute, but was much more crowded than Mickey’s House and seriously, Minnie drowning in a well is not quite the climatic ending that Mickey’s Movie Barn was. All in all I found it a bit disappointing, though my pink and purple heart quota was more than met for the day. 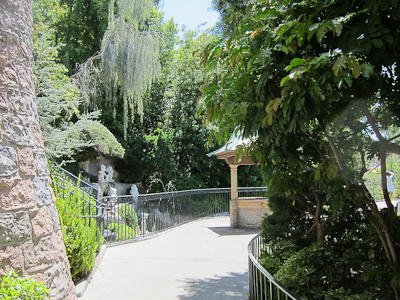 So I posted that there are two wishing wells at Disneyland and lots o’ people asked me where the other one is, and since I happen to already have a picture of it I thought I would be all clever and sneaky and post a picture of a part of it, and then pick a winner from the correct comments ON THE BLOG (not on Facebook!) to win my little contest. 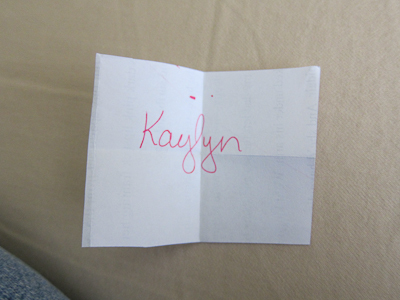 Okay, the confession part is that I wasn’t actually going to give out a prize, like I was just going to write in tiny letters that the “prize” was my love and admiration for a period not shorter than 24 hours, actual retail value (ARV) $0.00, your mileage may vary, and so on. BUT! BUT! Then I won a Disneyland prize myself! That’s right! I won a prize!!!!!!!!!!!!!!!!!!!!!!!!!!!!!!!!!!!!!!!!!!! The exclamation points are because I rarely, if ever win prizes. Now my grandmother, on the other hand, is just one of those lucky people. She can buy one raffle ticket and be the winner. If you walk into a room with a door prize, she’s leaving with it. But I, on the other hand, am not one of those lucky people. So I was feeling all Scrooge McDuckish about not actually giving a prize, but once I won something myself, I dove into my money bin. Or something. Did you know that Scrooge McDuck’s German name is Onkel Dagobert? Which translates to “Uncle Dagobert.” Just your German Disney trivia of the day*. I’m kidding. I didn’t try to reschedule. But I thought about it. ANYway, here’s my contest to you. 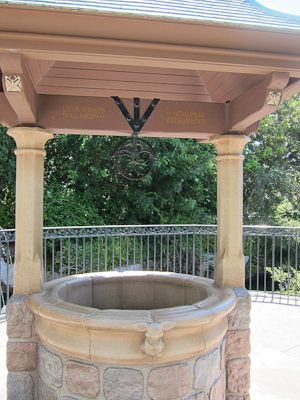 This is part of the second wishing well at Disneyland. Leave a comment here with your guess of the name and location of this wishing well, and I’ll pick from among the winners and send you a pair of mouse ears! Yeah, sorry it’s tiny. I’m not real great with pictures, so you’re going to have to squint or something. COMPLAINERS WILL BE IMMEDIATELY DISQUALIFIED!!! Go ahead and leave your guesses. I’ll check back in on Sunday night, because right now Kevin and I are taking our very first baby-free vacation in VEGAS, BABY! *if you’d like to make my husband and my German friend Melinda very happy, you can identify the translator who named Dagobert Duck. Yesterday I introduced you to Castle Secret Passages Part 1: Frontierland, with two bonus princesses (Belle and the pink one) thrown in. Today, I’m going to talk about the other secret passage. 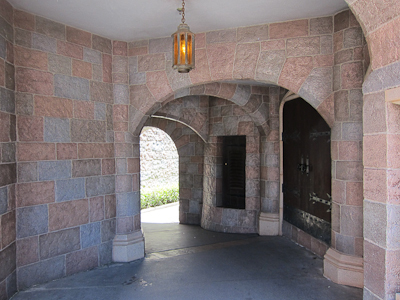 This one is on the right as you walk through the drawbridge, and goes to Tomorrowland. Compared to the secret passage to Frontierland, the passage itself is a little more interesting and also more of a straight shot to Tomorrowland. By interesting I mean a little more windy. Doesn't this look like it's going somewhere interesting? 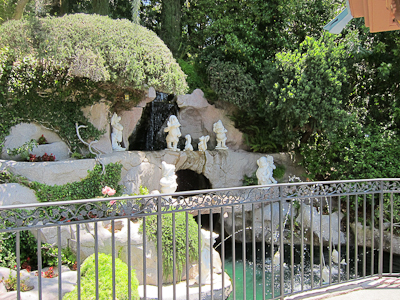 The nice thing is that you pass the very charming Snow White’s grotto and wishing well. Oh look! There it is! 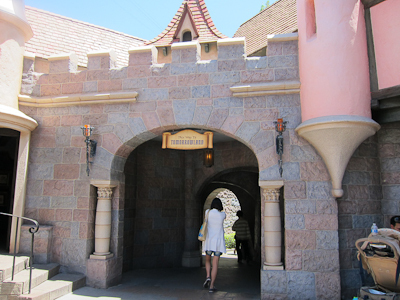 The first thing you’ll notice about Snow White’s wishing well is her dulcet tones ringing through the air. Unless the first thing you notice is the fact that there’s a wishing well at all. This is one of the most hidden charms in the park. One of two wishing wells in the park. Anyone know where the other is? I do. Apparently they clean out all of the coins and send them to some charity or something. The sign was non-specific. Also in the grotto are all seven dwarves. Dwarves in their natural environment--water. It has been at least 20 years, maybe a good 30, since I saw Snow White. As the original Disney animated feature, I’m a little nervous to see it again. Oh, and am I the only one who remembers this–way back in the day before VCRs, Disney used to release the classics in the actual movie theaters periodically? So if you wanted to see Cinderella, you just waited a certain number of years and then you could go see it in the theater. In some ways I long for that simplicity. Then I turn on my DVR and watch 6 episodes of the same show commercial-free. 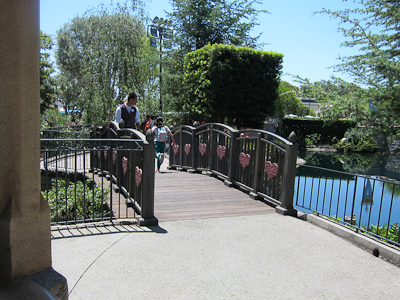 In a rather sickeningly sweet touch, the bridge leading to the grotto is festooned with hearts. And although I did not catch any this visit, I have also seen princesses hiding on this side too. Here’s your obligatory map. 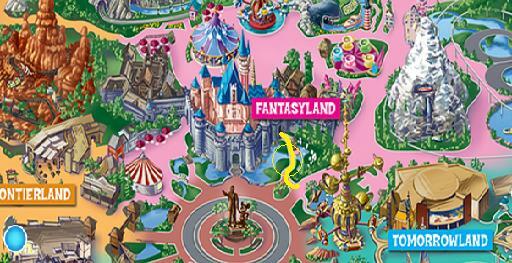 Circle denotes princess area.